Title says it all. Tried to reinstall arma tools, reintall/repair net framework, change work folder paths... nothing seems to work. 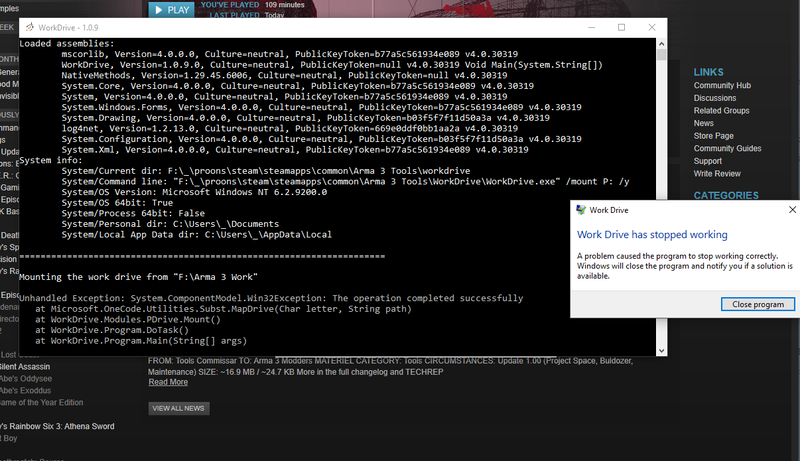 Work Drive crashes a few seconds after clicking "mount the project drive"
would you mind uploading your WorkDrive report files. Hey razazel did you get a look at the link? Or does anyone else know why? Help is on the way, please try to be patient. Thank you very much for helping out but i'm sorry to say that it still crashes when using the new files. Do you know what else the problem might be? Yes. Nothing wrong with the paths. The log file will located in a folder logs which will be created in the parent directory of WorkDrive.